The statue was installed in a public park. Medical students were outraged, attempted to vandalize the statue, and disrupted feminist meetings which they believed to be hotbeds of anti-vivisection sentiment. Counter-protest ensued, property was damaged, and students were arrested. By 1909, authorities had grown weary of the cost of policing, and in spite of protests and petitions, the statue was quietly removed in 1910 by heavily guarded workmen, and destroyed. February 2014 marks the 111th anniversary of the Brown Dog affair. In February of 1903, two Swedish anti-vivisectionists recorded the vivisection of an apparently conscious dog in a medical class at University College in London. They showed their account to the secretary of the National Anti-Vivisection Society (UK), who denounced the lecturer for violations of the 1876 Cruelty to Animals Act in a speech. There was a public outcry. The lecturer denied the charges and demanded an apology. The judge ultimately accepted his account rather than that of the Swedish activists. The records of the two Swedish advocates were eventually published as a journal by the Animal Defence and Anti-Vivisection Society and continued to sell briskly over the next decade. The British government appointed a commission, which eventually recommended tightening humane regulations, increasing enforcement, and establishing an advisory committee. That committee endured in one form or another into the 21st century, when it was replaced by an EU body performing the same function. In 1906, the World League Against Vivisection commissioned a bronze statue of the brown dog, with a plaque which asked, "Men and women of England, how long shall these things be?" 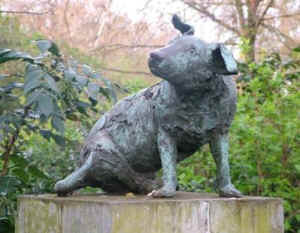 In 1985, the National Anti-Vivisection Society (UK) and the British Union for the Abolition of Vivisection commissioned a new statue memorializing the brown dog, with an inscription which read in part "Animal experimentation is one of the greatest moral issues of our time and should have no place in a civilized society. In 1903, 19,084 animals suffered and died in British laboratories. During 1984, 3,497,355 animals were burned, blinded, irradiated, poisoned and subjected to countless other horrifyingly cruel experiments in Great Britain." By the end of 2012, this number had increased to 4.11 million.